Last week, the Orange County Sheriff’s Department disclosed plans to skirt the new California sanctuary law, that limits cooperation with federal immigration officials, by providing all inmate release dates. 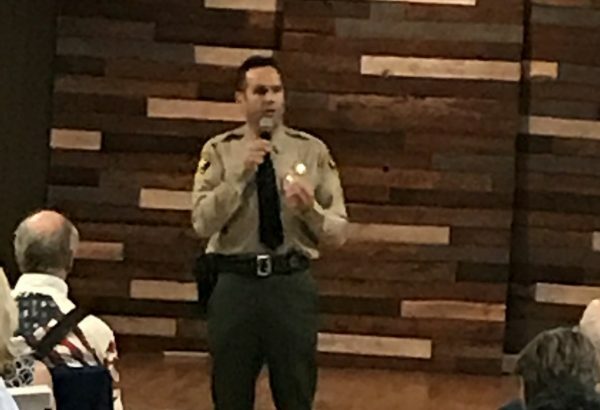 Orange County officials have voiced concerns that a failure to remove criminals in the country illegally was a threat to public safety. On Wednesday, Parkinson voiced his concerns with releasing people, who are in the country illegally and who have been charged with felonies, back into the community. In response to a question about Parkinson’s views on Orange County’s decision to skirt California’s sanctuary laws, Parkinson said his department already provides the public and other agencies the names of inmates and their release dates on its website. There is a very important bit of information that all of you anti-Sanctuary law people seem to be lacking. The limitations delineated in the law were not put into place by the law. They were put into place by the federal courts. This law was just poorly titled by Democrats in order to score votes. That aside, the law itself merely codifies the decisions of the courts. All states will have to follow essentially these same rules whether they have such a law or not. It really disturbs me how so many people can be so confident about their view on issues that they have not actually researched in an objective manner. You are reading this article, and this comment, on a device which provides you access to a huge percentage of mankind’s knowledge, and yet so few of you bother to actually put it to good use. What laws has Parkinson turned a” blind eye” towards? Please be specific because I am so tired of posts which insinuate and imply multitudes of wrongdoings by government officials, council members, department heads, etc..with absolutely no facts or specifics to back the claims. In reading a number of your posts you appear to be guilty as charged. Always attacking and pointing the finger but never providing the reader with anything but vague, opinion- based information. So, please take this opportunity to prove me wrong. Thank you Ian Parkinson, illegal immigrants who commit felonies should not be permitted to stay in our county. Can anyone think of a country they can illegally enter, commit a major crime and be let back out on the street. This is not racism, this is common sense! Well played Ian, keep it up. Wow. First the City of Los Alamitos, then Orange County, then San Diego County, and now ours. AG Becerra threatens Orange County and then Jerry Brown pardons and commutes the sentences of a bunch of felonious illegal immigrants. Could this be a rebellion within a rebellion? Hope it catches fire. How our Governor and Attorney General can so willfully violate the laws of our land without being arrested by the Feds is beyond understanding. You say that politics are to blame here, and that the issue is that people are trying to get “their guy” into office. Well, first, let me tell you that you ARE part of the problem for making such an uninformed assumption. You are not basing your opinion on a well-researched position, but on a defensiveness against what you perceive to be a partisan issue. That makes you partisan. Let me assure you that I am not a Democrat nor a progressive, but I am 100% against Parkinson. You are simply spouting rhetoric about “true leadership” and how he is “sincere and honest.” What is really disturbing about your choice of words is that it echos the EXACT same choice of words I have heard over and over by Parkinson supporters. Try using your own language at least. 1. Have you done any research into what the standard practices are for jails and healthcare facilities in dealing with mental health patients when they have problems transferring to local facilities that are supposedly full? 2. Have you actually watched the video of what happened to Holland in the jail, and compared what you saw on the video to specific statements made by Parkinson? 3. Do you think that the compassion and fairness that he demonstrates as an individual is also demonstrated by the people that serve under him? 4. Do you know what actual changes he has made to make sure this doesn’t happen again? You are correct on one point… it is sad when we can’t work together and be honest. Consider that last quality very carefully when choosing how to answer those questions.